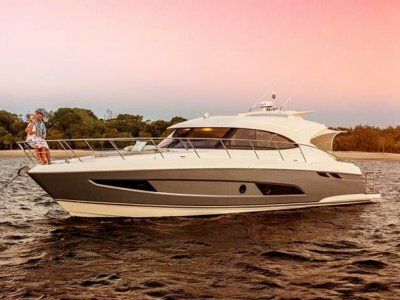 Go Back to Newsfeed Australia's premium luxury boat builder, Riviera, in conjunction with US east coast representative Grande Yachts International, will proudly Premiere the sophisticated 4800 Sport Yacht at the Bay Bridge Boat Show in Stevensville, Maryland, opening on April 12. “The alfresco layout of Riviera’s 4800 Sport Yacht, merging the welcoming and superbly equipped cockpit space with a luxurious and comfortable interior, is emblematic of Riviera motor yachts. “Riviera and Grande Yachts International are extremely committed to fulfilling the lifestyle dreams of America's discerning motor yacht owners, " said Mr Braley. “Over almost 40 years, Riviera has launched more than 5,400 yachts and has developed an internationally regarded heritage for innovative design. Every motor yacht is developed and built to handle the often challenging blue-water conditions of Australia’s coastlines. “The highly-awarded international designers, engineers and master craftsmen at Riviera’s yard in Australia are continually refining the designs and easy-to-use technology and equipment aboard these motor yachts that make the joy of Riviera ownership a sheer pleasure, ” he said.